While data is difficult to gather, sexual and gender-based violence in Myanmar is prevalent and has been characterized as a “silent emergency” by the United Nations Population Fund. Women face significant barriers in accessing justice, including widespread cultural and social stigma, low public legal awareness, deep mistrust in the formal justice system and lack of adequate legal protections, both formal and informal. As part of its work with MyJustice to strengthen women’s access to justice in Myanmar, IDLO launched its first workshop from April 7-10 in Mandalay. The first in a series of three trainings, the workshop convened 24 participants from nine community-based organizations to learn how to more effectively support women and girls in their communities through sexual and gender-based violence awareness initiatives. Most disputes are resolved at the local level; however, many community actors can lack the knowledge, skills and values necessary to deal sensitively and effectively with sexual and gender-based violence cases. In addition to legal assistance, survivors often require a wide range of support including medical and psycho-social services. Throughout IDLO’s work in Myanmar, sexual and gender-based violence has emerged as a priority issue. IDLO has been working in Myanmar with the United Nations Development Programme since 2014 to establish four Rule of Law Centres across the country, which provide communities with training, dialogue and access to resources to address local justice needs. Sexual and gender-based violence is embedded in the curricula through specialized courses, and the Centres have produced an Issue Brief dedicated to the subject in response to participants’ indications in community forums and discussions. Expanding on this legal empowerment and access to justice work, the project with MyJustice, implemented by the British Council and funded by the European Union, seeks to engage with community-based organizations with the ultimate aim of strengthening women’s and girls’ awareness of their rights around sexual and gender-based violence, and improve accessibility to services. While sexual and gender-based violence is predominant in communities, cultural and social stigma can present barriers for women who seek access to justice and needed services from providers. In response, the training included sessions on defining sexual and gender-based violence, identifying discrimination and understanding gender equality. 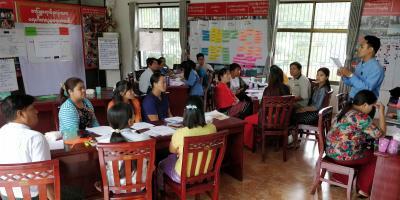 "Before this training I was not really aware of what domestic violence is,” commented a participant, Ms. Daw San Hla. “But through this training I have gained a stronger understanding and awareness of this issue." In response to the need to effectively resolve cases, participants also learned about the various pathways to justice, legal frameworks, processes and dispute resolution mechanisms. In addition to returning to their communities with newly acquired skills, the workshop provided an opportunity for organizations to connect, exchange and learn from each other.